Blue Lotus Cottage is a special plantation style beach cottage, custom built in 2005, and only one short block backfrom the ocean with a wide and direct ocean view. A short walk (100+ steps) takes you to a small sandy beach area. Kekaha is an old plantation town, away from the crowds and major resorts, situated at the base of the Waimea Canyon. You will definitely get the island experience in this people friendly town, with Hawaiian neighbors. Kick back on the shaded ocean view lanai, in comfy lounge chairs, and enjoy the ocean breeze and look for whales. Enjoy the best sunsets the island has to offer, and get the least amount of rain and humidity on your vacation. With less than 15 inches of rain a year, this is the place to be when the rain is falling on other parts of the island. The open floor plan incorporates the kitchen, great room, and dining area....all with a great ocean view. Walls of windows capture the trade winds, keeping the cottage comfortable. The kitchen has a large island with stools and granite countertops. The kitchen is fully equipped with newer appliances, including a glass top range, fridge, dishwasher, oven, and microwave. Cooking meals at home is a pleasure. Every kitchen small appliance is here from coffee grinder to rice cooker, food processor, and a blender to make that island drink. Beautifully furnished with wicker, sea grass, teak wood, island decor and art. Maple wood floors and fans in every room. A master bedroom with it's own bath, newer King bedroom furniture and mattress. There is also a second TV in the master bedroom. The second bedroom has NOVA MEMORY FOAM KING BED, and lots of soft pillows for added comfort. This room can also be made into a twin room upon request. There is a trundle bed in the 3rd bedroom, also with memory foam. All of the linens are new 500 ct. cotton sateen, and the towels are thick and thirsty. The personality and charm of this cottage will make your vacation one of the best experiences ever. Kekaha Beach Park, about 1 mile away, offes lifeguard safety. Salt Pond Beach Park, about 15 minutes away, is a perfect crescent shaped beach park, which is ideal for small children with small waves. Polihale State Beach is for the adventurous beach goer, looking for that wild dune backed beach. After a bumpy 5 mile dirt road, you are rewarded with a secluded beach that is, to many, the most beautiful on the island. At the base of the Waimea Canyon, you have direct access to fantastic scenery, and miles of hiking opportunities. It is often been called the 'Grand Canyon of the Pacific'. Hanapepe Art Night, every Friday night, is for the art lover and only 10 minutes away. It's restored galleries have many art treasures for viewing and purchase. Waimea, only two miles away, has two larger grocery stores, restaurants, and a movie theater. Don't miss the fresh shrimp from the nearby Sunrise Shrimp Farm. Within minutes, there are several restaurants for breakfast, lunch, or dinner. For a special night out, the Poipu Resort area offers you numerous upscale dining and shopping opportunities. Fifteen minutes to Port Allen marina, this is the starting point for the Na Pali Coast boat tours. Also nearby by, the Kauai Coffee Plantation offers taste testing and tours. There is also a public golf course that offers inexpensive golfing, in a historic hill top setting, offering challenging golf and fantastic vistas across the island. But most of all, this former plantation community is a beach town. You are guaranteed to have the driest and sunniest weather on the island each day, and access to 15+ miles of nearly deserted beach. Mornings are generally electric blue skies with light breezes. The sunsets are only seen from this part of the island, and they make for a memorable end to another day in paradise. Come and visit for awhile, and you may find yourself wanting to stay forever. 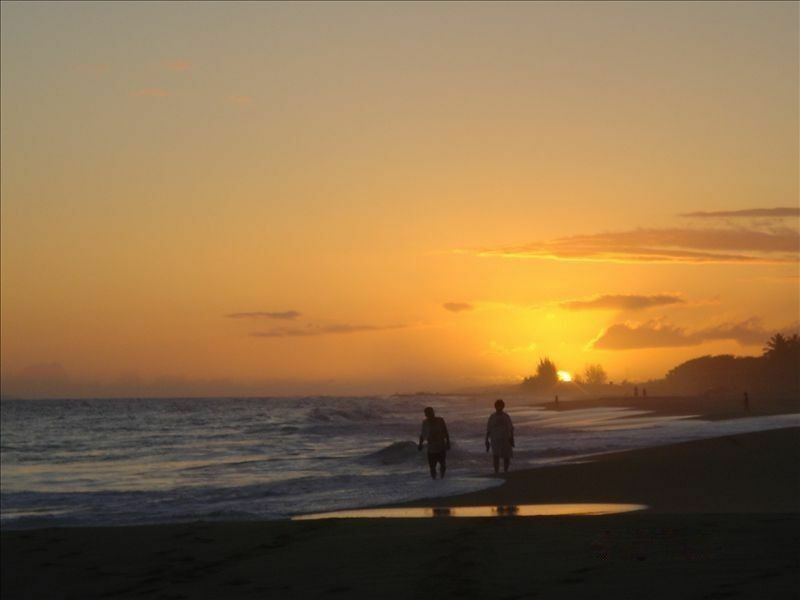 People fall in love with Kauai, and often come back every year, to spend their days by the sea in the sun and surf. Why not give it a try? You can spend a week here, for the price of two nights at one of the resort hotels. This is living....island style! Live Aloha! BEST WEATHER ON THE PLANET! We purchased the house, being from New York, looking for a warm and sunny place to spend some quiet time. More sun and warmth. Less rain and humidity. Quiet and more old world Hawaii. Love the 15+ mile beach. This is the real Hawaii, not the one of resorts and expensive hotels. Favorite thing to do is just walk out the front door, across the street to the beach, and grab a spot under palm trees slightly to the left and watch the ocean and sunsets. Love to sit out on the lanai and read. I like to cook fresh fish, among other things, and that's why I have such a well equipped kitchen. We have done most of the excursions and just like to relax at home mostly. But my favorite excursion is taking a catamaran up the Napali Coast. Cook's dream kitchen with everything you could possibly need. Large island with granite counter tops. Boogie boards & all necessary beach equipment, Fully equipped kitchen w lots of amenities, spices, etc. NOVA MEMORY FOAM King Beds & memory foam toppers. Fans in every room. Lots of windows and light. Ipod player. Island Art and photos. All island furniture & decor. Grassy yard with fruit trees. Ocean view from porch (lania), kitchen & front room. Ocean sounds! Wood floors. We had a great vacation. The house is equipped with everything we needed. The only downside was the heat in the back bedrooms, the window air conditioners just couldn’t cool them enough. Just be prepared for the roosters, there is nothing that can be done but they are vocal and in abundance. Everything was wonderful. The location was perfect with a beach that is within walking distance, the kitchen and bathrooms were well-stocked, very quiet neighborhood. The house was also super clean! Overall we were glad to stay and we would stay again. Kind of hard to understand such a nice review and only getting 4 stars. Since we always strive for five, we would have liked to have seen 5 stars with such a positive review. Nevertheless, we hope to see you again soon. The house is perfectly equipped for an enjoyable and relaxing stay. Ocean view is breath taking espesially the sunsets. Shopping facilities in Waimea are near so you need not to go out for dinner but can cook or use the grill. We really enjoyed the vacation on Kauai - many thanks! Nice location, quiet and very close to the beach. The house is fully equipped with everything a vacationer need. We lived comfortably except when problem exist like power going off, there's no immediate response available. Our last 2 days of stay was not so comfortable due to power outage in both bedrooms, the master and across. No power on all the outlet. We stayed most of the time in livingroom to watch TV. The masterbed has a/c but not the other room. I thought the fridge is down but I think it's just the lightbulb. We did respond to the guest saying that the refrigerator was not working. However, upon inspection, it was working fine, but the interior light bulb needed to be replaced. They had also mentioned that the A/C in the second bedroom was not working. It had just flipped the breaker in the breaker box. Once it was turned on, the A/C worked fine. There are a total of 4 air conditioners in this house. Peaceful, Comfortable, and so close to the Beach! This place is the perfect getaway! Comfortable, quiet home with everything you could ask for. A/C, full kitchen, comfortable beds and a quiet neighborhood. So close to the beach I walked there each night to watch the sunset. Beautiful! I will be back! Right across from the beach. Air conditioning in the unit * there were four, made the stay incredibly comfortable. Beach towels, umbrellas, beach chairs, coolers, snorkels, body boards, bbq.... great touches all included. Waimea Canyon visiter's park and museum with many hiking trails, Kekaha Lifeguard Beach within walking distance, Salt Pond for children wading and sea salt collection, Polihale State Park, Boogie boarding, Fishing, Waimea movie theater, and farmers market close by.